Ramadan is a month of spiritual renewal and self-discipline–a path that is characterized by struggles and challenges that are unique to each person. Sometimes, those unique struggles can get in the way of making the most out of Ramadan. The Family and Youth Institute has prepared this Ramadan Toolkit with practical tips on how to nourish your spiritual selves while simultaneously managing the realities of your daily lives during this blessed month. This toolkit includes resources in the following 7 categories. Ramadan is a time when you may strive to change your habits, heal from hurt, or set new goals. This section provides various resources on the psychology behind changing your behaviors. Watch this video or read this article to understand the science of behavior change. Greater knowledge will increase the likelihood of success in reaching your goals. If you are planning to break bad habits, this video highlights how bad habits are formed, maintained, and eventually reformed. Similarly, this video highlights changing your habits using a system of identifying/understanding cues (or a trigger for an automatic behavior to start), routines (the behavior itself) and a reward (which is how your brain learns to remember this pattern for the future). As you embark on personal development in Ramadan, your success can be bolstered by setting SMART goals. Use these goal setting tips and tools to increase the likelihood of your success. Try to be comprehensive in your goal setting and try to track your Ramadan goals, progress, and reflections. Consider including goals to improve your marriage, family, or parenting skills. For women, menstrual cycles or young children can sometimes derail from your goals–be compassionate with yourself, understand your reality, and focus on what you CAN do! In addition to individual spiritual growth, Ramadan is an excellent opportunity to reconnect as a family unit. Experiencing the struggle and hard work of ibadah (worship) can become a means of strengthening family bonds. The FYI Community educators developed the following article on creating family traditions to empower you with ideas to engage your children and increase family togetherness. In addition, The FYI Community Educators, Duaa Haggag and Nadeem Siddiqi give additional tips, pointers, hadith, and homework in this webinar that is designed to help families strengthen their relationships in Ramadan! Coping with illness in the month of Ramadan is not easy. In this section, there are resources with narratives and practical strategies regarding the balancing act between illness and experiencing the joy of Ramadan. This resource provides encouragement and practical tips for how to make the most out of Ramadan as someone who struggles with a chronic illness. Ramadan, for individuals struggling with mental illness, can sometimes feel isolating. The following personal narratives may help you realize you are not alone. If you are a health professional who works with Muslim patients, check out the following resource for guidance regarding general advice for fasting, modified pharmacotherapy and other planning strategies as your patients prepare for this month. For recent converts/reverts to Islam, the first few Ramadans as a Muslim can be both exciting and challenging. Start with these videos specially developed for converts to help prepare yourself mentally, physically, and spiritually. Learn the basics about fasting and use resources to guide you through this experience. Trying to figure out how to explain Ramadan to your family who is not Muslim? This video shares some advice on interacting with your family during Ramadan. Unfortunately, sometimes converts/reverts experience emotional difficulty due to lack of family support. This resource highlights some struggles faced, such as isolation and loneliness. Overcoming these emotions is not easy, however, this article offers practical advice for new Muslims. Ramadan is an exciting time for Muslim students but they may experience some difficulty navigating the school context. For schools, it’s important to provide an environment for Muslim students where they feel supported in practicing their religion. Teachers can also do their part in creating a welcoming space for Muslim students during this month. To learn from the story of one school whose staff worked together to accommodate students in Ramadan, check out In consideration of Ramadan. Refer to this list of children’s books about Ramadan and Eid, which can also be integrated into the classroom. As a working professional, the experience of Ramadan can be difficult to navigate with meeting-filled workdays, travel plans and food-centered meetings. 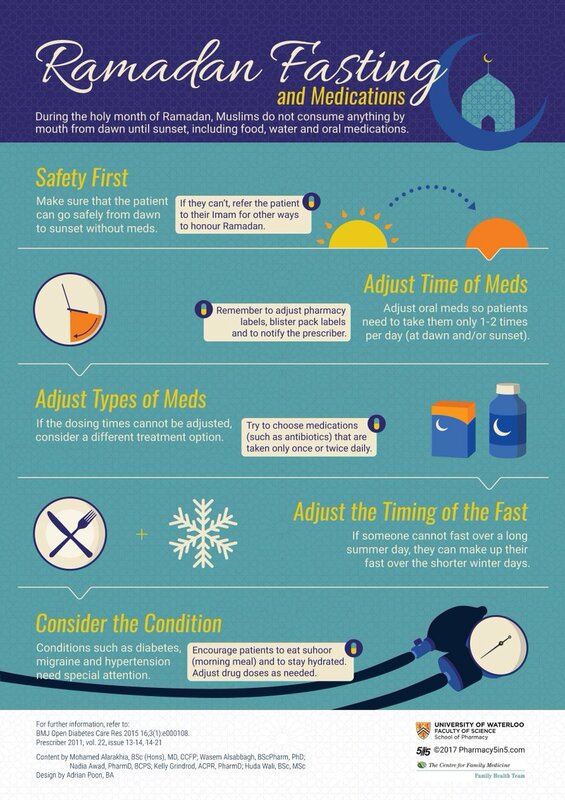 Check out this infographic and this guide for some guidance on maintaining productivity and balancing fasting with workplace demands. In order to successfully meet the needs of Ramadan in the workplace, it is important to involve and educate your employer and coworkers. The Ramadan Etiquette Guide is an informative guide that you can provide to your coworkers to help them understand how to support you in Ramadan. Employers can also provide the Ramadan etiquette guide to staff to increase awareness about this month that is important to fellow Muslim co-workers. Additionally, refer to this guide and article about strategies that you can adopt to support your Muslim employees. A key factor that may impact your productivity in Ramadan is your health–at a time when you want to be performing at your most efficient level, you may feel lethargic and have low energy while fasting. Investing time into your health, fitness and food choices, is one central way to maximize your potential in Ramadan! For a refresher on the basic nutrients your body needs daily and how to meet these needs during Ramadan, refer to this resource. Prepared by medical experts and Islamic researchers, this Ramadan Health Guide provides more detailed information about balancing nutrition while also maximizing the benefits of fasting. The guide also contains a section for doctors and medical professionals, to enable them to provide more informed services to their patients. Don’t forget to make an appointment with your physician to plan for medications in Ramadan. This infographic summarizes some of the steps needed and/or points for discussion. Maintaining your fitness routine during Ramadan may be the last thing on your mind while fasting. However, these guidelines provide information about the timing, duration, and quality of your workout during Ramadan, as well as specific plans for men and women. Creating a 30 day meal and fitness plan may help you stay motivated and focused. Many women wrestle with the choice to fast or not during pregnancy as well as while nursing. As an expecting mother, it is important to assess your health and speak with your physician and religious leader in order to determine what is appropriate for your situation. Similarly, as a nursing mother, the potential impact of fasting on low milk supply is important to consider, as well as alternative forms of ‘ibaadah (worship) one can engage in if she is not fasting. This toolkit was authored by Aminah Raazi, BA with help and support from Madiha Tahseen, Ph.D., Sameera Ahmed, Ph.D. and Sarrah AbuLughod, MA. We would also like to thank our panel of reviewers for approving the content in this toolkit: Najla Abdur-Rahman, M.D. F.A.A.P; Tahir Khwaja, M.D., Samuel DeMarco, and Kaylei Stromberg.